The $26.2-billion acquisition could result in the customer-targeting solution(s) B2B marketers have been waiting for. Obvious opportunity lies in enhancing Microsoft’s existing solutions to improve user experience. For example, videos from Lynda.com, a website for training videos that LinkedIn bought in 2015, could be accessible throughout the Office suite, such as an Excel document. But for B2B marketers, the most exciting possibilities involve “new opportunities … for monetization through individual and organization subscriptions and targeted advertising,” as Nadella puts it. Jenny Sussin, a Gartner research director, proposes that LinkedIn’s value to Microsoft lies in its algorithms and user data. Successful integration into Microsoft’s existing products could be a game-changer for the B2B sphere, in terms of targeting customers. First let’s consider the algorithms, two of which Sussin claims were the main attraction for Microsoft. “No. 1 was the algorithm that creates the connection graph, the social networking graph,” she says. “No. 2 was the algorithm that determines the information most valuable and most actionable to you.” Essentially, with this acquisition, Microsoft has the ability to map how professionals are connected and determine what content is most relevant to each individual user. Secondly, LinkedIn has the most comprehensive, up-to-date personal data about its 433+ million global users of any professional network. And that data has not been available to other companies — LinkedIn even refused access to Google for ad sales — until now. The value of this information to any B2B organization is indisputable. Now consider that there are 1.2 billion users of Office and 4.4 million users of Dynamics CRM. Microsoft can now combine the information it knows about those professionals with LinkedIn’s user data, map their relationships, and offer customized content within these products. Imagine being able to reach your target customer within the very tools s/he uses most every day. And those are just two of Microsoft’s products. Skype, Yammer, MSN: there is no shortage of targeted advertising opportunities. Perhaps the most exciting of these secondary properties for B2B marketers is Bing, Microsoft’s search engine. Bing Ads are attractive to marketers because of the low cost per conversion. The problem, of course, is volume, as Google dominates the market share. But with LinkedIn’s data and algorithms, Bing could become “what search is sorely lacking today for B2B targeting,” says Marketing Mojo CEO Janet Driscoll Miller. Targeting could include factors like company size (e.g., spending capabilities), so marketers would not waste impression dollars advertising products that are far beyond the buyer’s price point. Fold in other LinkedIn solutions, like Lead Accelerator, to improve retargeting, and Bing Ads could really compete. Google may have a leg up in terms of search volume, but without detailed data on users’ professional demographics, Bing could corner the market as the most effective B2B ad targeting platform. While the marriage of LinkedIn and Microsoft’s capabilities shows great promise, hold off on celebrating just yet. 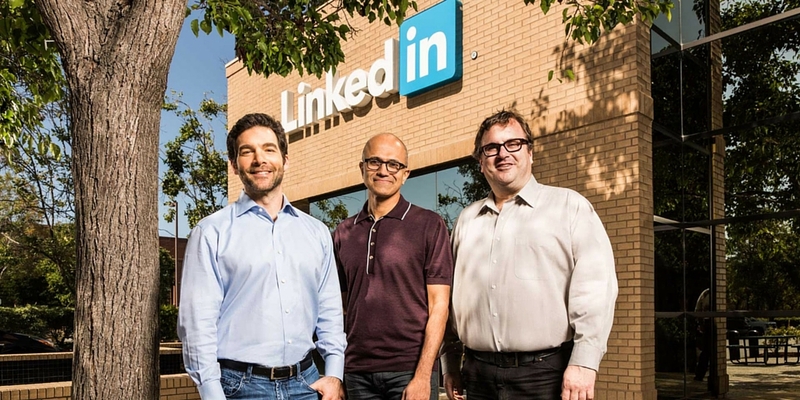 Part of LinkedIn’s value to Microsoft derives from user-provided information. And part of Microsoft’s value to B2B marketers lies in its products’ ubiquity. But what if people stopped contributing their personal details to LinkedIn because of the way it was being used across the Microsoft suite? And what if businesses stopped using Microsoft products over privacy or data security concerns? Here’s why those are both real concerns: Nadella suggests that your LinkedIn newsfeed could show relevant articles based on the projects you’re working on offline. Taking information from my desktop?! That’s problematic from both a personal and proprietary standpoint. Issues around invasion of privacy and the breech of secure business information could present major roadblocks to success. How would you feel if a software product you researched yesterday appeared in your Outlook today? If, while preparing a PowerPoint for a client meeting, a pop-up suggested you contact a connection in your LinkedIn network who is an expert on the topic? With the deal projected to close before the end of the year, users reactions to these concerns over the next few months could be telling.